However, I get a kick out of this fried rice recipe. Why? For the simple reason that I am a big chilli addict. I happened to come across a fried tomyam noodles recipe when i was surfing through some local food blogs, and decided to adapt the recipe for fried rice. As I love my food spicy, i usually throw in my favourite ingredient - the chilli padi. Sometimes I forget that I have such a high threshold for spice, that my hubby gets the brunt of it when he eats my food. But no worries, for this recipe, the little killer chilli padis have been left out. I love the flavour of this fried rice, especially with the fragrance of the lemongrass. Seriously, what can go wrong with tom yam and seafood? 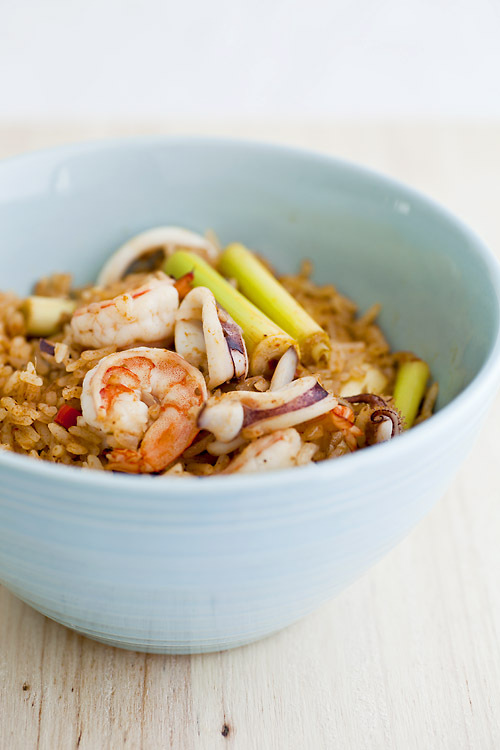 - Return the previously cooked seafood that you set aside and mix in thoroughly with the rice. * If you are a big chilli padi fan as I am, slice 2 chilli padis and fry them together with garlic, onions and lemongrass at the start. Be warned that it can get real hot!